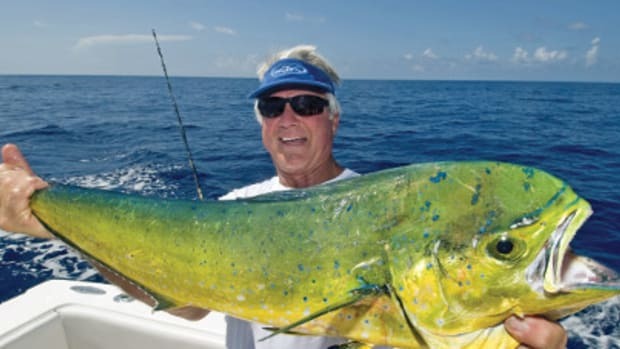 NFL coach Jimmy Johnson won two Super Bowls with the Dallas Cowboys and a national title with the University of Miami, but it’s fishing in the Florida Keys that gives him the most satisfaction. Johnson moved to his current home in Islamorada 11 years ago, and his name graces Jimmy Johnson’s Big Chill at Fisherman’s Cove, a dining and entertainment complex, as well as a private residence club in Key Largo. Johnson began visiting the Keys in the mid-1980s while he was head coach at the University of Miami. Toward the end of his time at the university he earned his dive certification and developed a lasting love of the subtropical island chain. “I came down to the Keys for my final open-water dive and just fell in love with the place, the people and all the things you could do down here,” he says. Click play to watch Johnson in action with a rod and reel. Behind his Islamorada estate, he keeps a 39-foot SeaVee center console with twin Cummins diesels and a 34-foot Venture with a pair of Mercury Verados. “I have to have a backup boat,” Johnson says. Both are dubbed Three Rings after his three coaching championships.